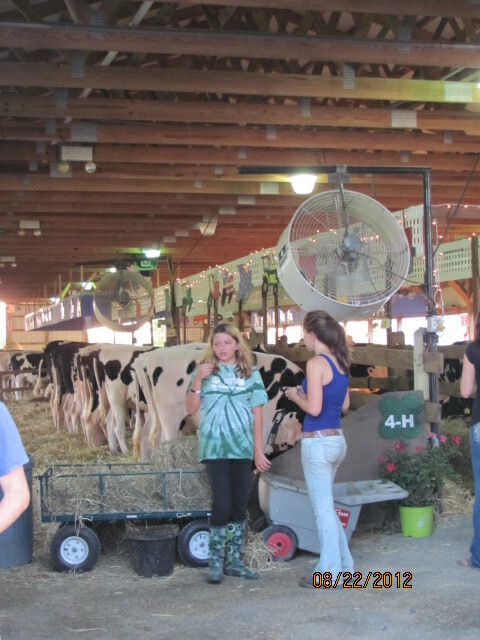 Yesterday was opening day at the Hunterdon County 4-H and agricultural Fair. “What language did you just speak?” the hot air balloon man said as I climbed into with first one foot, then another (Ha, Ha, Ha). What I was really saying very fast was, “I’m feel like I’m an Olympic athlete (thinking gymnastics-pommel horse) trying to the climb up into this thing.” First, I put one foot up, then I quickly (split second) realized, my best way was to get on my knees (the leather edges of the balloon’s basket were very soft), hold on to the ropes, and hoist myself up, and then step down. “Hooray, I’m in.” All of this happened very fast. 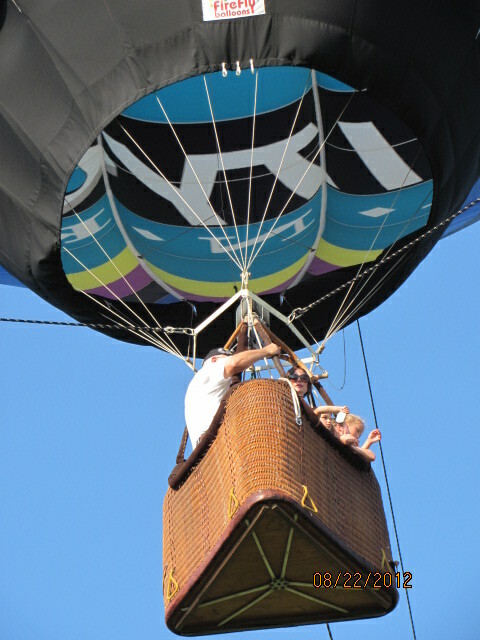 The prior riders had to stay inside the balloon’s basket to provide weight until both my husband and then I got in. My husband is taller, so he practically stepped in with ease. Let me backtrack to the beginning. 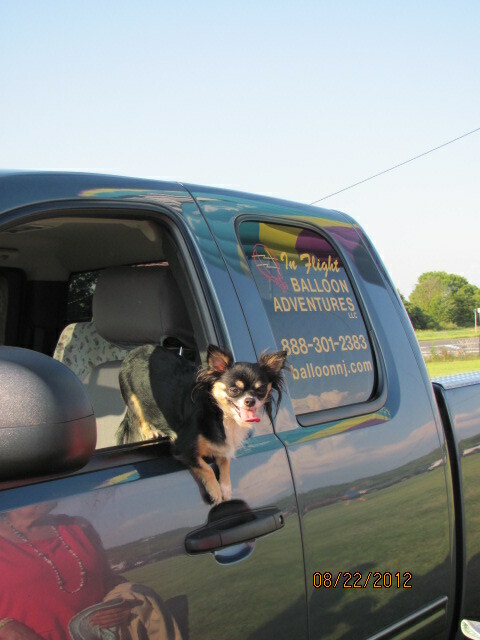 As soon as we parked the car, and started to walk along the gravel road, a rep from the balloon company asked us if we wanted to try the Hot Air Balloon ride. I asked, “How long are you up there?” He said, “About 30 seconds, then the balloon slowly comes down. Pat is always game to try new things, and said, “Yes, we’ll do it!”, and the man said to gather over there to wait. I’ll get in line, but there’s still time to change my mind, I thought. There was hardly a line. I’ll have to say that the hardest part was climbing into the hot air balloon basket!!! I had imagined that it might feel like a giant rocking chair swaying in the sky to the wind’s, I was hoping, gentle breeze. To my amazement, I was correct. Of course, this was a trial, and the hot air balloon was tied securely on three sides to three heavy pick-up trucks. I was holding on to the camera, and my husband asks, “Have you taken a picture yet?” No, I say, as I’m clutching very tightly to the camera string, I might drop it. “Pass it to me,” he says. So here’s my picture too. 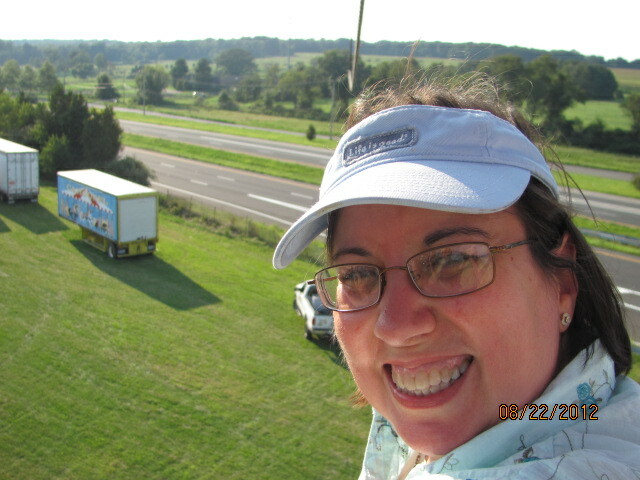 I’m up in the hot air balloon, “Smile for the camera”! Would you like to see how enormous the fair is? This is the “bird’s-eye view”!! 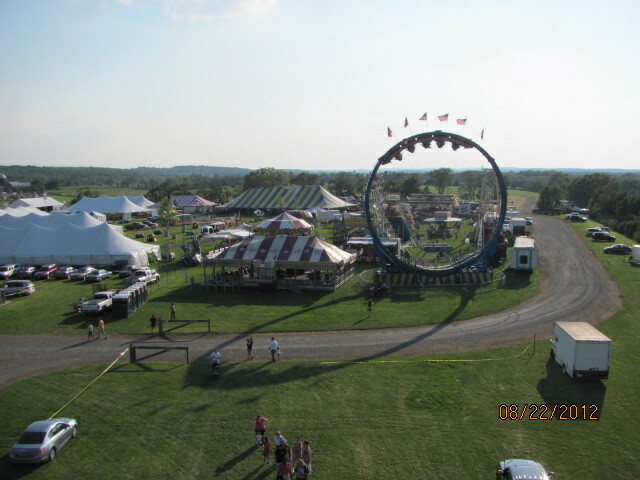 A “bird’s-eye” view or “hot air balloon eye”-view of the Fair!! Look at all those tents, red and white striped ones, and there’s an enormous amusement ride to the right of the photo. 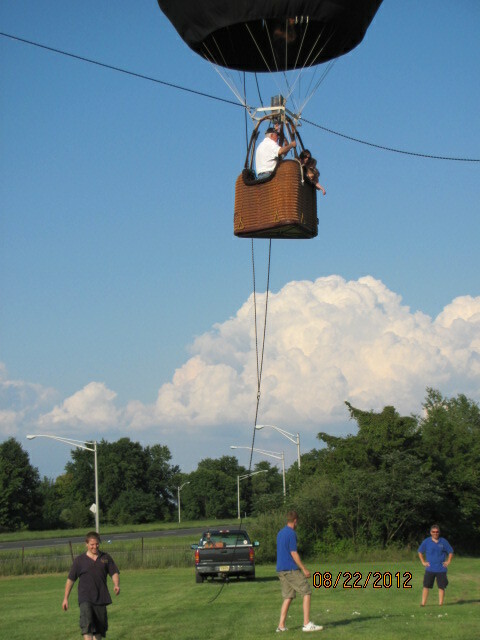 Can you see the heavy ropes secured to both the hot air balloon basket and the two pick-up trucks? Hot air balloon and the cable and ropes. 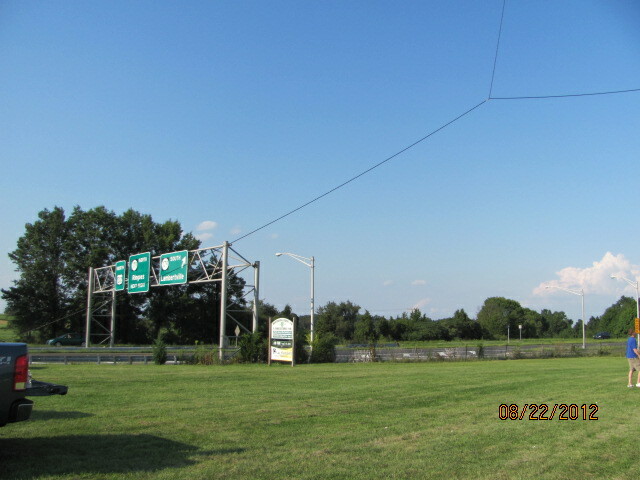 In the photo above, there is one of the pick-up trucks, a dark green truck that the hot air balloon is secured to with cable lines. The balloon company workers are wearing the light blue tee shirts. Very nice and helpful guys. You must listen and follow their instructions of when to climb in and when to climb out of the balloon’s basket. They are pretty strong, too, when my mother had her turn in the hot air balloon, they lifted her out of the basket. a view inside the hot air balloon! Of course, I zoomed in , while standing on the ground to get this shot of the interior of the balloon. While I was on the hot air balloon, it was exactly that , Hot!!!! , I felt the heat, but I didn’t look up! 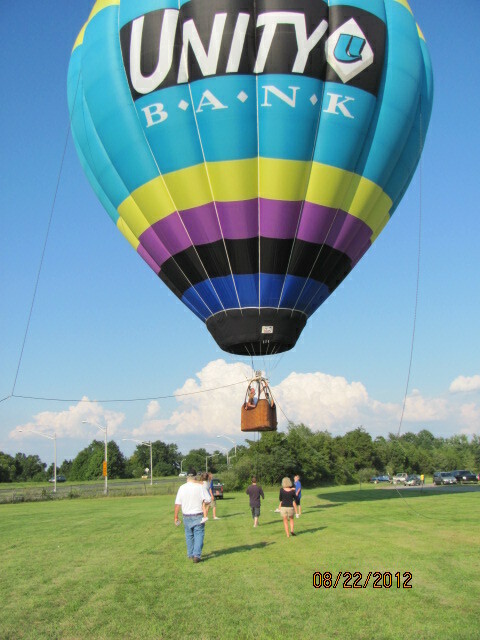 In Flight Balloon adventures is the name of the company. This little dog was so cute, and very friendly to us. He was well trained to stay inside the pick-up truck, too. Let’s get our walking shoes on and get this party started. 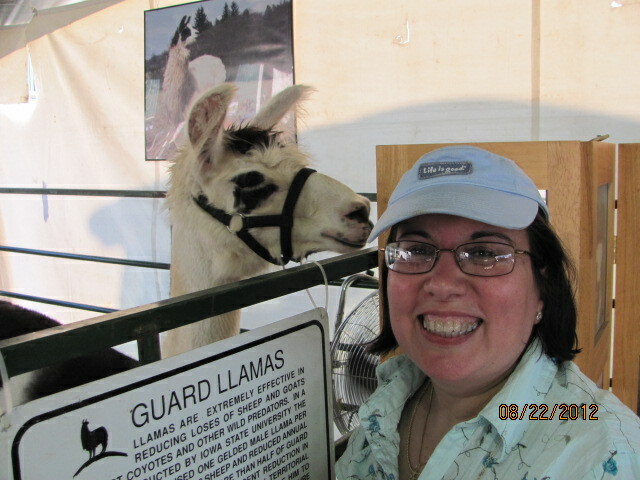 Here’s me with one of the llamas!! Did you know that llamas are used on farms as guard animals, “guard Llamas” . They protect against wild coyotes. I can see why, these animals seem cuddly cute but they are very tall compared to a sheep. 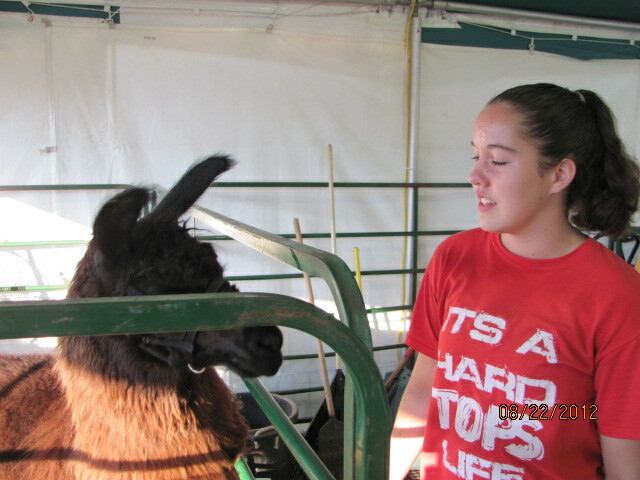 This teen is showing this llama in Dressage and an obstacle course on Saturday night. 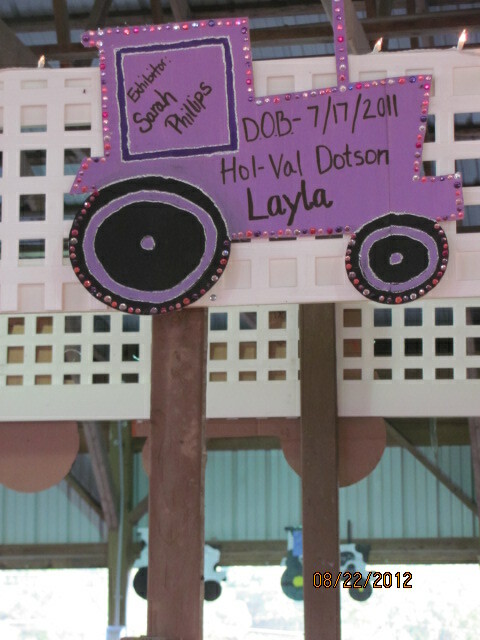 two 4-H ‘ers at the entrance to the The cow barn! Come on, we’re going to take a little closer look at the cows! Cows are my favorite farm animal!! You can call me cow paparazzi!! 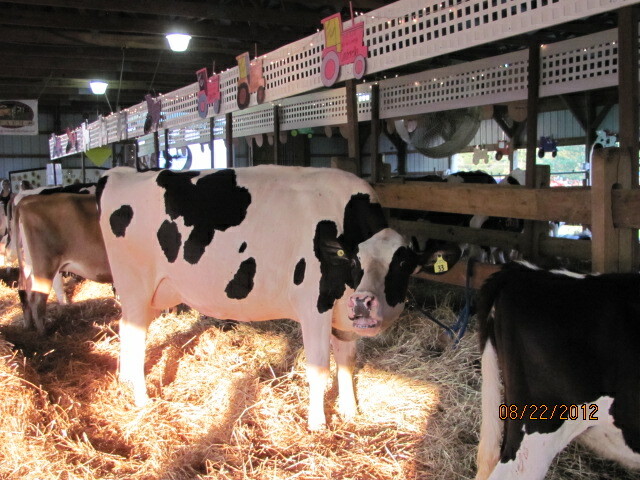 Cows at the Hunterdon county fair. There is a tent where judging of the cows take place as well. Cow and the pink sign above has birthdate info. 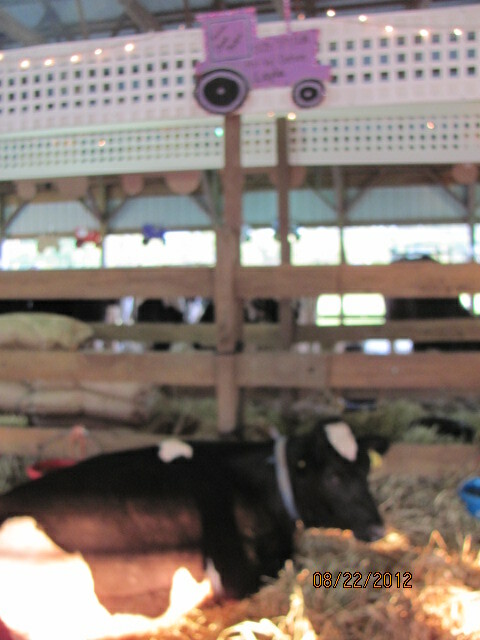 the cow’ s name is ” Layla and is one years old. 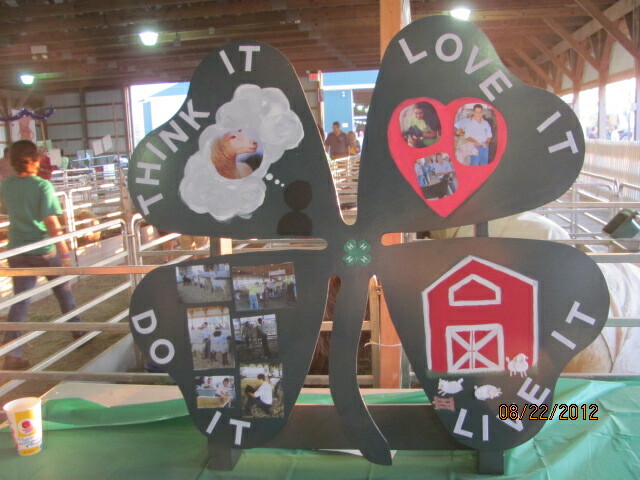 Do you know the 4-H Pledge? my head to clearer thinking. Both my sister an I belonged to 4_H clubs from the age of 9 years through high school; each year, we entered our cooking and sewing projects and in our teen years did twirling demos and competitions.